Fish and chips is a classic dish that’s also a sign of summer vacations near a beach. I myself have many fond memories of eating crispy fish and chips slathered in malt vinegar and salt, all while smelling salty air from a weather-worn picnic table. It’s certainly not a healthy dish but, it’s not like you eat it all the time, right? So when I was asked to come up with a recipe to highlight a flagship beer from Sarasota-based brewer JDubs Brewing Company, I thought about all kinds of things to do with beer. But the one I kept going back to was fried fish in beer batter. . . 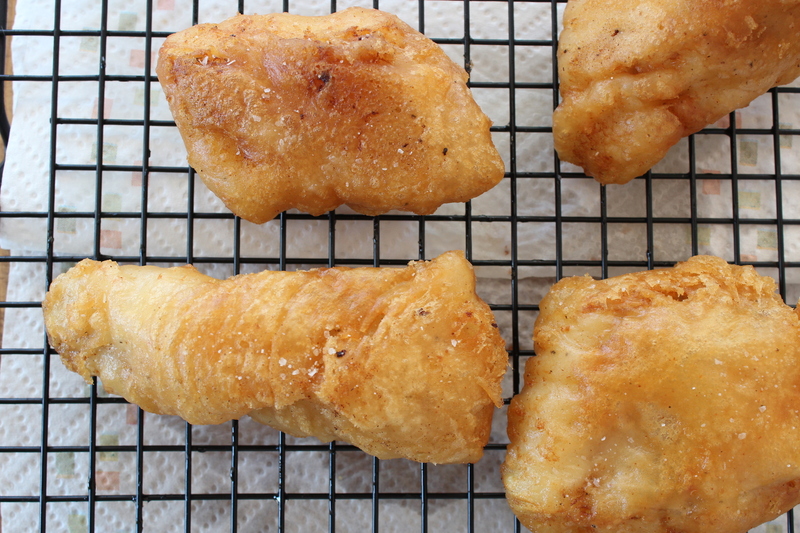 Unless you detest fish, or don’t eat fried things, or drink beer, or all three, fried fish is a great way to make fish at home because it cooks quickly at a high temperature, staying moist and flaky. And it’s not as hard as you might think. But it is pretty messy, I’ll give you that! As I’ve mentioned in other posts, frying in my house is not commonplace. But duty called, so I got out the FryDaddy. 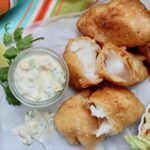 This batter has equal parts flour and cornstarch which provide texture, lightness and golden color to the fish. It also has baking powder which gives the batter extra lift so it’s not sludgy. And the beer, well that’s for flavor and acidity to balance the oil’s heaviness, plus it has carbon dioxide for airiness. Just about any beer will do. 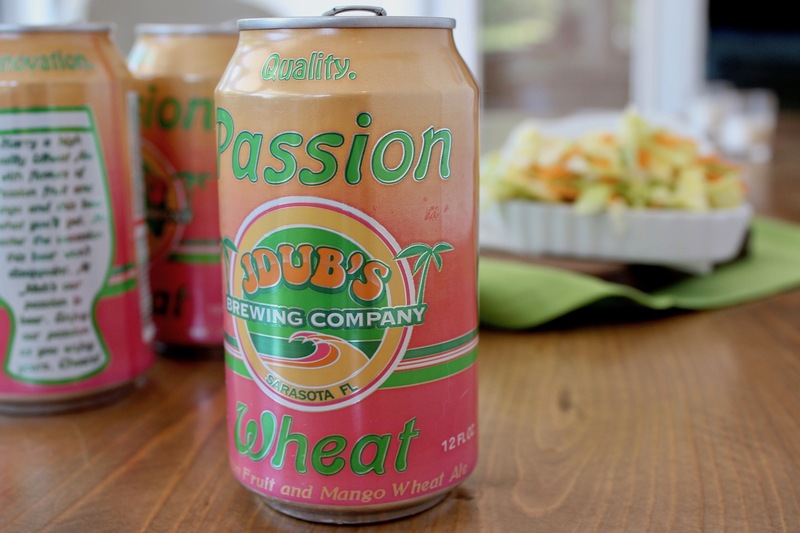 Wheat-based beers/ales are a little lighter, offering welcome freshness to the heaviness of fried food, and the brew I chose from JDubs is called “Passion Wheat” — a wheat-based ale, with hints of mango and passion fruit and just enough sweetness to make this batter extra tasty. Look at that crispy, golden fish! The sauce complements this ale’s flavors. 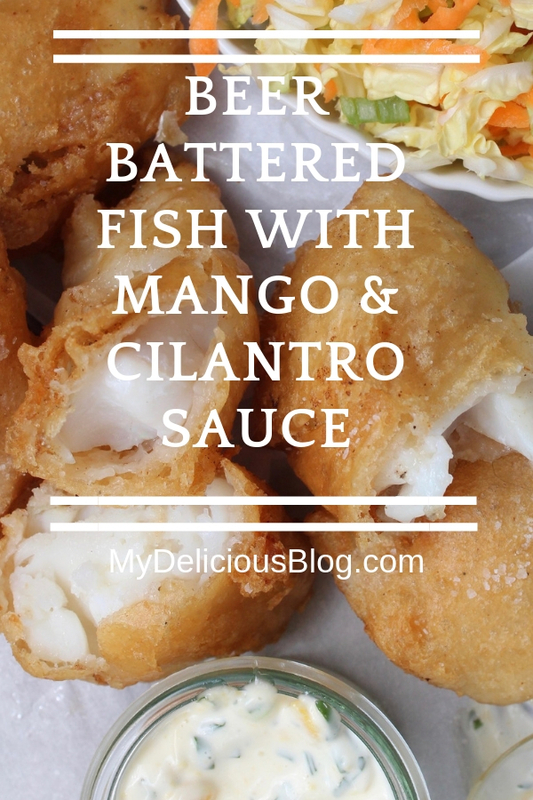 It’s got mayo, mango, scallion, cilantro (if you hate cilantro, go with basil or parsley) and lime juice, and the brightness enhances the subtle essences in the batter. But if you love traditional tartar sauce with briny pickles, capers, sweet relish and hot sauce, by all means, go with that. By now you’ve noticed there’s no chips. . .I couldn’t bring myself to do it, because I would be powerless over those crunchy edges and creamy insides. So I made a flavorful slaw — tasty, and just a tad healthier than chips. (P.S. no recipe below, but here goes: toss in a bowl 2 cups shredded Napa cabbage, 2 sliced scallions, a big pinch of salt, a few grinds black pepper, a pinch of sugar, juice of 1/2 lime and 1+ tablespoon vegetable oil and mix all together). 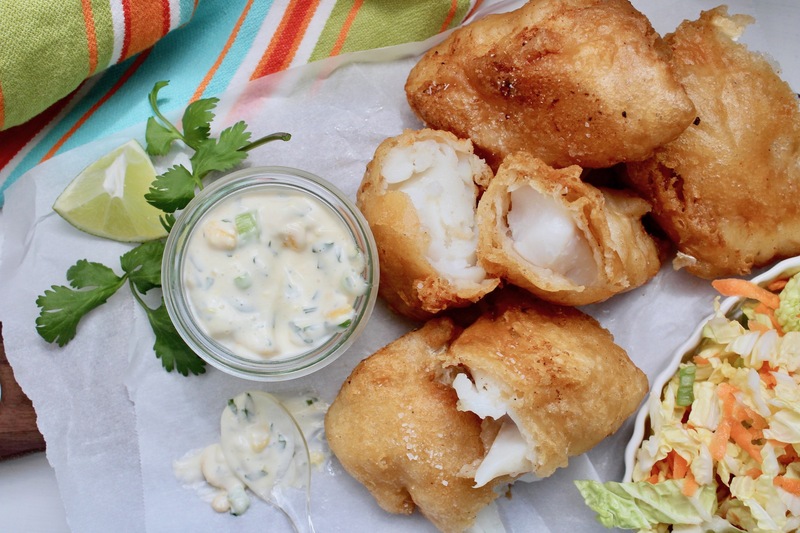 Light, airy battered fish, alongside mayo, mango, lime and cilantro sauce. Not your traditional tartar sauce, but perfect with the Passion Wheat ale used in this batter, with its hints of mango and passion fruit. Add dry ingredients to a bowl. Add beer and whisk to ensure no lumps. Cover and refrigerate 20-30 minutes. 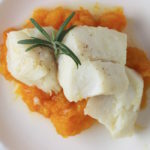 As you wait for the batter to firm up, add oil to an electronic fryer or a deep Dutch oven (you may need to add more oil if you have a wide pan so there’s enough to coat the fish). Bring oil up to 375 degrees and test with a deep fry thermometer. When oil reaches 375, remove fish from the refrigerator, pat the pieces dry with paper towel; sprinkle with a little kosher salt and black pepper. 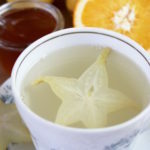 Remove batter from the refrigerator and stir to refresh. Set up a rack over a baking tray, or place paper towels or a newspaper on a plate - this will be for draining the cooked fish. Drop 2-3 pieces of fish into the batter to coat well. 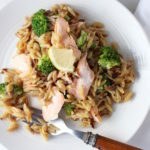 Lightly pick up each piece with a fork and carefully place it into the hot oil, going away from you, to avoid splattering. Cook 2-3 pieces at a time, depending on size of pan and the thickness of your fish (and you don’t want to crowd the pieces or they’ll stick to each other). The fish should take 3-4 minutes or until golden brown. Remove with tongs or slotted spoon, place on draining area and sprinkle each with a bit of kosher salt. Test oil to ensure it’s 375 degrees, then repeat process for remaining fish. Optional - squeeze on a little lemon juice. 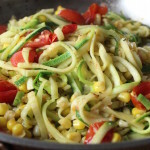 Serve with Mango/Cilantro Sauce. Combine all ingredients in a small bowl and mix well. 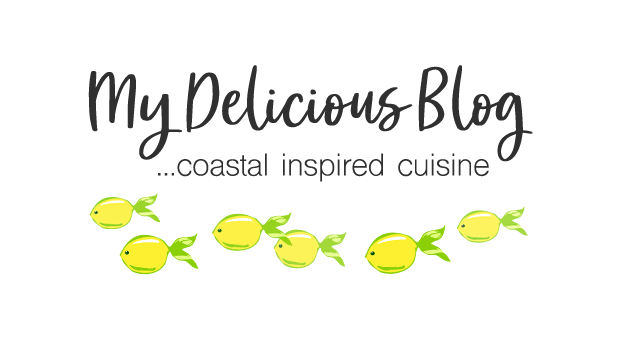 Taste for seasoning then refrigerate until ready to use. We love frying fish in our fry daddy. We will try this new batter recipe! Fried fish with a salad is a balanced meal. You can quote me on that. You know how I love fried fish. After reading this I just have to make some. Oh boy!! What happened to the mango??? That was just a test to see if you were reading the ingredients 🙂 Ha Ha! 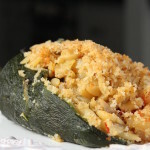 Sorry about that – just updated the recipe! How much mango goes into the mango sauce? Please see other comments 🙂 It has been a busy week! Did you forget the mango?